“My son just isn’t bothered to learn about what I do, he sits around waiting to hear that he’s got a job in bidesh…”. Ramesh was lamenting his 20-year-old son’s lack of interest in his profession as we worked on new Kaligarh designs one afternoon in his workshop. It was a common complaint; I’d heard it from Mahesh and many others, too. But that didn’t make it any less poignant. Life here is not easy for traditional artisans. Many grew up in a world where it was assumed that children would follow in their fathers’ footsteps, inheriting his customers and earning new ones over the years. But as the economy has opened up in ‘new Nepal’, the children of artisans are turning away from their parents. Greater opportunity and flexibility in the job market is not a bad thing. But too often, they opt for what they consider to be the easier route to financial security – unskilled work in the Middle East, notorious for its unregulated, gruelling labour conditions. When I came to live and work in Nepal over half a decade ago, this paradox struck me almost immediately. Here was a place replete with cultural wealth, yet even as visitors marvelled at the craftsmanship on show, the future kaligarhs of Nepal were abandoning their trades to take on hard labour in faraway lands. And strangely, few other young people (from non-artisanal families) seemed to be entering the sector either – at least where jewellery was concerned. Maybe it was that the market for artisanal products was as yet undeveloped. Whatever it was, it was clear that the scenario was not attractive enough for its practitioners. The idea behind Kaligarh was to support small-scale artisans by designing and creating exciting new products while offering them a fair price for their unique skills. 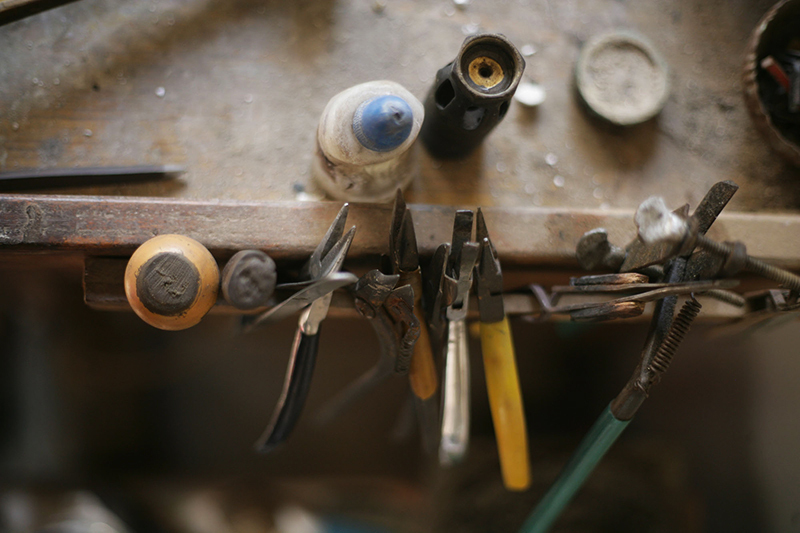 Ideals aside, what stands out for me is the experience of working one-to-one with each artisan. Over the last year, we have explored new ideas and techniques together, and come up with solutions to new problems. This has not been easy! Kaligarh’s adaptations and designs have thrown up quite a few challenges, but we’ve worked through them together. And thankfully, all of us are ever more motivated by the results. Today, I’m happy to say that we’ve come some way since I first stood in front of Ramesh’s jewellery workshop in Patan (above), daring myself to interrupt him as he frowned in concentration, huddled over his worktable. With the launch of www.kaligarh.com, you’ll be able to see the first creations of our team, about whom you can read more here. These are early days, and I hope you will follow Kaligarh as we continue on our way.